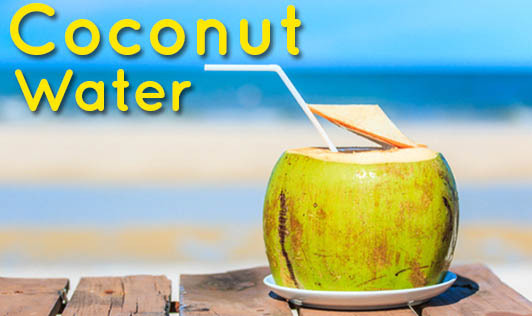 The tender coconut water is a clear liquid, most nutritious, wholesome, isotonic beverage that the nature has provided for the people of tropics to fight the sultry heat. The liquid is clear, sweet, and sterile and composed of easily digestible carbohydrates in the form of sugars; also contains electrolytes, vitamins, minerals, enzymes, amino acids, cytokine, and phyto-hormones. Each nut may contain about 200 to 1000 ml of water depending on the cultivar type and size. Coconut water is an isotonic beverage that rehydrates the body and replenishes the body`s fluids, which are lost in various activities like sports, exercises etc. Coconut water aids in maintaining a normal body temperature. It contains very good amount of electrolyte potassium and sodium that helps keep the body’s pH balance in check and help replenish electrolyte deficiency due to vomiting and diarrhea. Coconut water is an effective digestive tract cleanser. It is said to improve the immune system as it contains essential vitamins and minerals. Myth: Coconut water is more nutritious than milk. Fact: This is not true. Milk is rich in protein, fat, carbohydrates and sugars. In addition, milk is a wholesome food that contains several vitamins like vitamin A, B complex, C, and minerals like calcium, potassium, sodium and magnesium and immune boosters. The coconut water contains only few of the minerals. Myth: Coconut water consumed by pregnant women in third trimester will help clean the stomach and amniotic fluid. Hence the babies are born fair and with clear skin and eyes. Fact: : Coconut water is very good for pregnant women because it contains electrolytes like sodium and potassium that help to rehydrate the body and is known to help prevent urinary tract infections. But that does not mean drinking coconut water can make a baby to be born with clear skin. Coconut water by itself can be a refreshing drink or can be consumed chilled. Fresh coconut water can be made as a special mock tail by adding lemon slices, mint leaves, orange/mango zest etc. It can be added to sweet dishes prepared at home to give the flavor. It can be used instead of water to prepare the batter for sweet dosas, which can make a very nutritious snack for kids. It can also be used to prepare the batter for muffins with a few fresh coconut pieces in it.